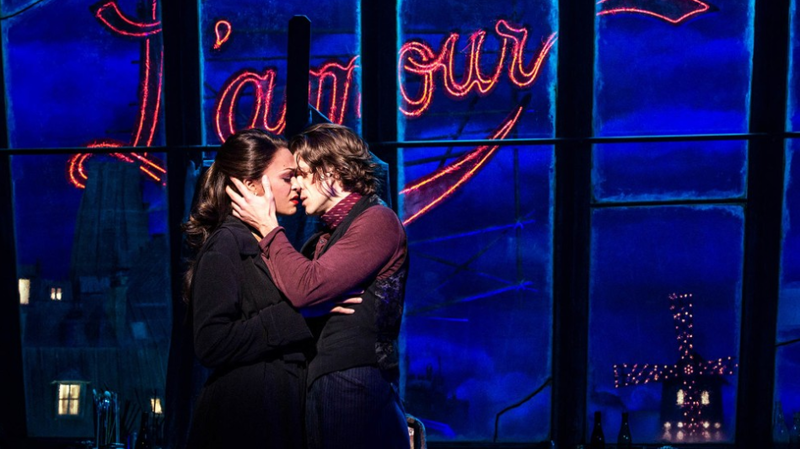 The “new” musical Moulin Rouge! is very keen for you to know what an exuberant, exciting show it is! From the moment you walk into the theatre, there is a lot going on! You get a whole bunch of set (courtesy of scenic designer Derek McLane) for your money! There’s a large, lightbulb-studded windmill! An enormous elephant looms from one of the boxes! Below that, a scantily-clad performer dances on a pole! Two other dancers come down front and center to swallow swords! And the show hasn’t even technically started yet! If you were hoping the show would include the cover version of “Lady Marmalade” from the original 2001 Baz Luhrmann movie, good news: it starts out with that number! It goes on for a very long time! Sonya Tayeh’s choreography is very intense and fun to watch, and it’s performed by a diverse, energetic cast of performers! Catherine Zuber has designed lots of bright costumes, including a dazzling array of multicolored can-can dresses! The music features more hits from the original movie! It also includes a bunch of newer pop songs that you’ll recognize! It’s basically a mashup of the DJ’s playlist at the last wedding you attended! Whoever arranged securing the rights to so many popular songs is the true hero of this production! Hearing and seeing talented Broadway singers and dancers perform these numbers is kind of fun! It’s like a revue! It can get rather loud! But if you don’t like any given moment in the show, there will be something else to look at faster than you can blink! 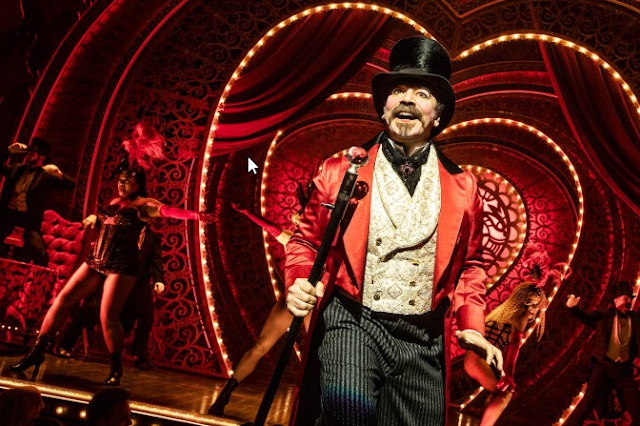 Here’s Danny Burstein as club owner Harold Zidler, looking and acting suspiciously similar to an M.C. from a venerable musical (looks like someone wants to direct Cabaret next!)! Here’s Karen Olivo descending from the heavens on a glittering swing! We even get Rick-rolled! At some point, book writer John Logan manages to elbow his way into these upbeat proceedings, and we’re reminded that we actually have to sit through a story of some kind, in addition to (or at the expense of) all of the high-energy singing and dancing. It’s actually a pretty sad story – the play’s hero, Christian (Aaron Tveit) informs us right away that the other main character, the courtesan Satine (Olivo), is dead. This is, of course, a serious matter, and we’re meant to feel the weight of that looming tragedy, as well as the high-minded principles that this doomed love affair represents, throughout the rest of the show. There are frequent invocations of the bohemians’ creed: “Truth! Beauty! Freedom!” Sahr Ngauhjah, who’s enjoyable in the part of Toulouse-Lautrec, defends the show that the main characters are trying to produce with a speech about the importance of depicting life truthfully, as well as the power of art and artists. The speech drew approving cheers from the audience on the night that I saw the show. 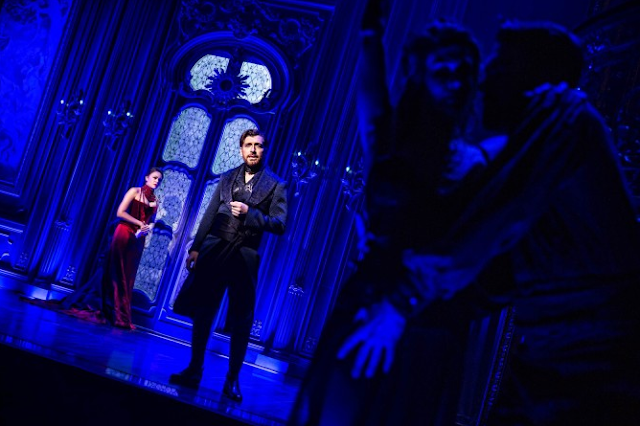 Of course, he’s invoking all this in support of a show-within-a-show that, so far as I can tell, is basically a cut-rate mash-up of La dame aux camellias and Carmen; another character in the show even dismisses it as melodramatic. The play ends on a downbeat note . . . except: surprise! There’s a very lengthy curtain call! It features reprises of all the hits from the show, as well as a few new songs (Outkast's “Hey Ya!” makes it in)! The villain to whom Toulouse-Lautrec delivers his defiant speech is the Duke (Tam Mutu), who has exploited Zidler’s dire financial straits to take ownership of both the Moulin Rouge and Satine, who attempts to carry on an illicit affair with Christian while keeping her patron happy so that she and her co-workers don’t end up back on the streets. The Duke isn’t happy with the direction of the show that he’s bankrolling, since it’s a barely-veiled version of the love triangle in which he’s been entangled (for all their lofty artistic pretensions, these bohemians don’t seem to know how to imagine a dramatic scenario that departs from their own personal experience). He complains that there’s too much talk, and not enough singing and high-kicking. He’s right, at least insofar as Logan means for his line to serve as a meta-theatrical commentary on Moulin Rouge! itself. Indeed, the playwright may have inadvertently made the Duke the true hero of this play: he’s a handsome patron of the arts who tries to support a fledgling theatrical enterprise in the face of hostility from the band of obnoxious, self-righteous bohemians whom he’s financially assisting, and whose commercial – and perhaps artistic – sense is inferior to his own. No matter; he disappears in a line of exposition at show’s end. In one sense, the most appropriate contemporary pop hit that gets interpolated into the show is Sia’s “Chandelier,” a song about drinking and partying to hide inner emptiness; it scores the scene in which Christian and his friends guzzle down absinthe in an attempt to forget their woes. Moulin Rouge! has a certain appeal, so long as it keeps one hand on the absinthe bottle or – to invoke another controlled-substance metaphor that’s more apropos to the show’s initial energy and breakneck pace – one nostril on the mirror. But once the buzz wears off and we begin to sober up, the fun peters out pretty quickly. In addition, the fact that a show like this supposedly needs characters and dramatic stakes to maintain our interest keeps getting in the way of our being able to enjoy seeing how the creative team is going to shoehorn a familiar pop song into a given scene. The musical attempts to take on a darker, more serious tone in the home stretch of the second act, but I couldn’t help noticing that every time a character broke out into a new number, which was meant to deepen our sense of looming disaster and the character’s emotional anguish, there’d be a volley of appreciative laughter from audience members as they recognized the song. In that regard, director Alex Timbers bears much of the blame for failing to shape the dramatic action or give us much of a sense of what’s at stake here. Tveit’s a talented performer (I enjoyed seeing him in Company last summer at Barrington Stage), but he’s got very little to do here except to alternately gaze starry-eyed at the balcony and Olivo or, when he finds himself at a crisis in his relationship with Satine, to glower, fall to his knees, and sing very loudly and intensely. To her credit, Olivo keeps trying to rein in the over-the-top impulses in her character and find some grounding in reality, but it’s hard. There’s very little to work with in the script, and the characters are all thinly-drawn archetypes. It doesn’t detract in any way from Ngauhjah’s performance to point out that one of the reasons he’s able to find success with Toulouse-Lautrec is that he’s arguably the closest thing the show has to a complex, well-defined character. The bold, bright beginning of Moulin Rouge! offers a sort of sugar-rush appeal, which comes back, albeit with diminishing returns, during the extended curtain call. What’s sandwiched in between often feels perfunctory and empty. Emphatic jubilance has its place, but when it’s almost all that a show has going for it, the rest comes to feel unsatisfactory in a hurry.